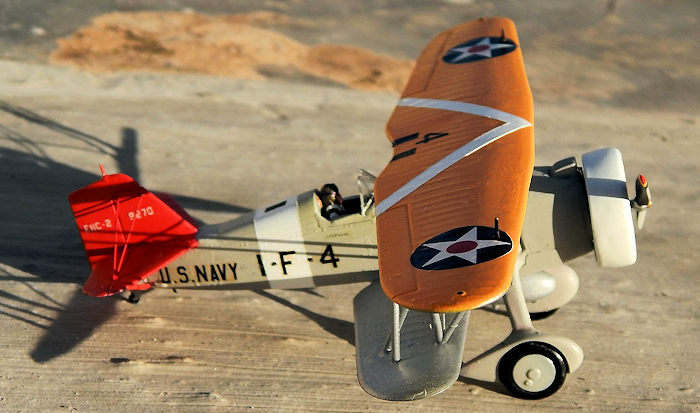 Originally developed for the US Army, the Curtiss biplane served a long and active career with the US Navy and Marines. 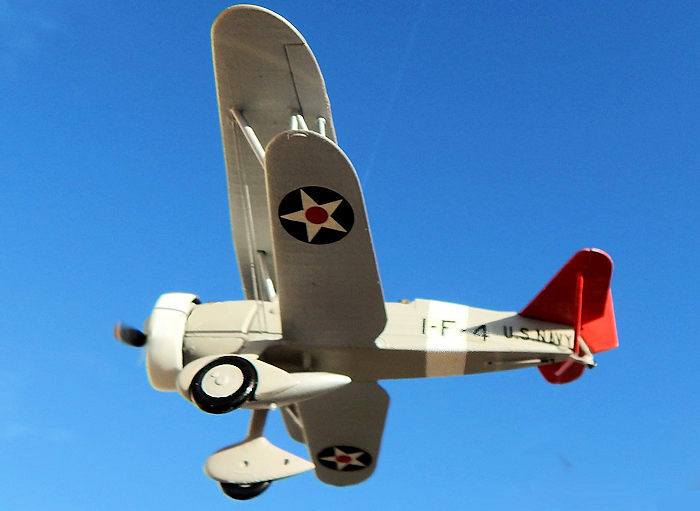 Although initially allocated an F- for fighter designation, the Curtiss Goshawk was one of several dual-purpose aircraft employed by the US Navy in the 1930s. as acknowledged by the allocation of BF (Bomber/Fighter) designation later in the career. It was essentially developed from the P6/F6 Hawk series built for the US Army and Navy. Twenty-eight F11C-2s were ordered in October 1932 and delivery of the first aircraft began in the following April to US Navy squadron VF-1B on board the USS Saratoga. In March 1934 the F11C-2 were reorganized as BFC-2, undergoing modification, which included a semi-enclosed cockpit canopy and built up rear fuselage. Eleven aircraft were transferred to the USS Enterprise in 1938 as the newly formed bombing six. However it remained doubtful that these BFC-2s ever flew off the deck of the carrier. They were replaced by Northrop BT-1s the same time as the enterprise was commissioned. Except for that short five-month period only one squadron flew the aircraft. This was the famous “High Hat” unit VF-1B, which flew the F11C-2 from February 1933 until February 1938. The F11C-2 was a relatively small aeroplane by today’s standard having a wing span 31.5 feet, and a length of 22 feet 5 inches. It was powered by a nine cylinder 700hp Wright Cyclone engine a top speed of 198 mph with a service ceiling of 24,000 ft. Armament consisted of two symmetrical Browning .30 calibre machine guns and one 500 lb bomb that could be carried in place of the streamlined belly tank. This is an accurate model of the F11C-2 produced by Monogram that can build into a nice model. 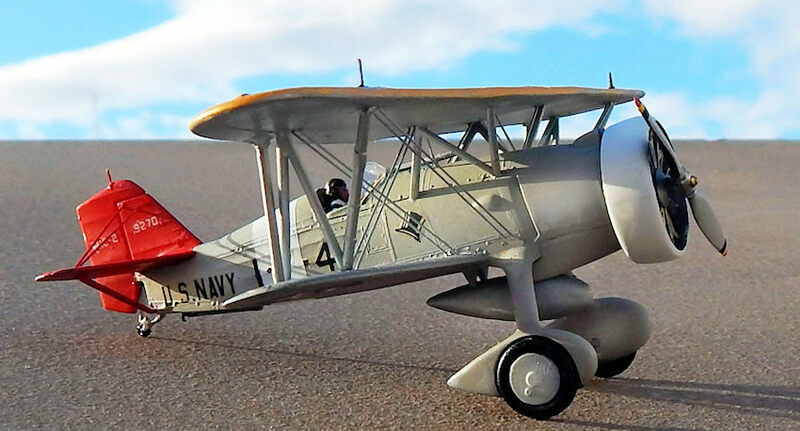 I had the kit for quite a long time but recently I was building kits from the pre war era of Navy and Marine types and the chance arrived to build the Goshawk. In spite of age on this model, released in 1968 the kit is well detailed including an accurate pilot figure. Moulded in silver styrene, with ample of surface detail to the fuselage as well as the ripple covering on the fabric wings being quite effective. The only issue with this kit is the repeated ejector pin marks on the under wing surfaces that required careful filling and sanding. The twin page instructions contain history of the aircraft, a three-view monochrome plan view depicting the colours of the aircraft, decals placement and four stage assembly diagrams. Decal sheet was well printed and good back then but I have substituted the star insignia with similar size ones from a Micro Scale decal brand. 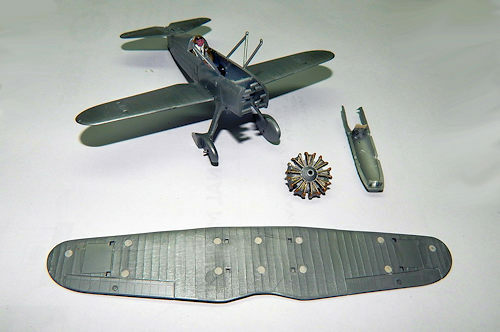 The kit had the interior painted and crew figure also painted as per instructions and the fuselage could then be assembled. Instrument panel had the printed decal attached and fixed in place. A crew seat was added from my spares and the crew figure glued in place. The right fuselage half was then cemented to the left half. Lower wing was cemented to the lower fuselage but the belly tank which is silver painted was to be fitted at the final stage. In the meantime the fuselage was given the first coat of light gray, an area was then masked at mid fuselage so that a white bend is airbrushed. This will replace the white decal sheet that has turned pale yellow with time on it. Tail fin and rudder was cemented to rear fuselage and tail stabilisers also cemented. The fuselage was now masked and the lower wing given a coat of silver. While assembly was allowed to dry, the five-piece engine and cowling were assembled after first painting the engine and exhaust. The cowl was painted white. The propeller blades were also painted light grey at front and black at rear. Prop tips were painted red yellow and blue and this was also left to fit at a later stage. Upper wing was first given a undercoat of white and once dry this was painted orange yellow. The underside painted silver and it was now ready to lower it on the assembled struts attached to fuselage and lower wing. A good feature with this kit is the unique and foolproof method for precise alignment of the wings and landing gear. The cabine struts and landing struts are molded onto the fuselage halves at the correct angle. 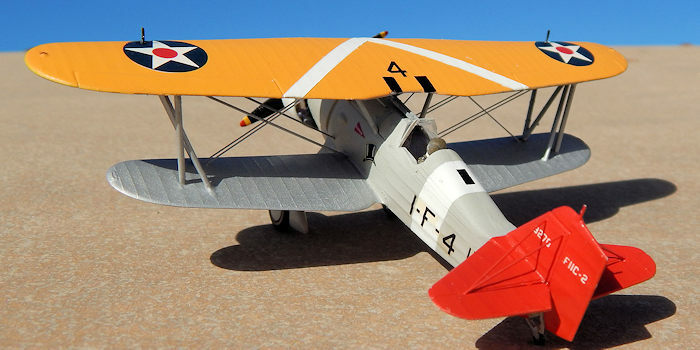 This provided automatic and perfect positioning in areas formerly considered difficult in the assembly of biplane models. When the wings assembly is strong enough, rigging holes were marked at appropriate places making reference to photos of the real F11C picked on line. These were drilled to form double parallel rigging. Fine gauge fishing line was used for the rigging which were secured with a tiny drop of super glue.. Areas effected by the drilling holes were sanded and retouched with paint. Fuselage was painted light gray close to Gull gray while wings fabric and control surfaces painted silver. Tail unit was reed and the fuselage band and cowl being white. Kit was given an overall coat of Johnsons Klear and decals applied making use of Micro Scale decals wherever possible. Finally a satin coat of varnish was applied when all parts were attached to the kit, prop, wheels and the painted wind screen fixed in place. I Have much enjoyed building this highly admired plane of early 30’s that saw service with the famous “High Hat” squadron aboard the carrier USS Saratoga. I certainly recommend adding this interesting model to those keen on early Navy shipboard types when an opportunity to obtain such a kit comes around.